Obama is risking making the same mistake Carter did during the Iranian revolution in 1979 by continuing to back Mubarak’s dictatorship in Egypt to keep right wing members of his own party and the Republican opposition happy. 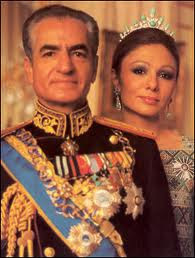 This ensured the transition was chaotic, allowing Khomeini and extreme fundamentalists to crush the liberals and socialists among the opponents of the Shah’s dictatorship. To minimise the chances of the same happening in Egypt, Obama should tell Mubarak, his NDP party and the Egyptian military to stand down and allow a National Unity government , as demanded by Egyptian protest leader and former IAEA head Mohamed El Baradei , allowing a peaceful transition to democracy. He should also tell Egypt’s government and military they won’t get a penny more in military aid till this happens. As El Baradei says US government “life support to the dictator” must end (1). 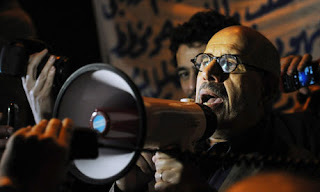 El Baradei, the protest leader in Egypt, could not be more different from Ayatollah Khomeini, the senior protest leader in Iran in 1979. He is no Islamic fundamentalist and no potential dictator or theocrat. There is no guarantee what the new government in Egypt will be, whatever Obama does, because Mubarak’s time is running out just as the Shah’s was in 1979. So Obama would be better dropping him to get some influence with the new government – and help ensure the Muslim Brotherhood doesn’t freeze out other opposition groups entirely - than alienating opposition groups who may soon be the new government. Even if the Muslim Brotherhood come to power through elections – like the AKP Islamic government in Turkey and Hamas in Gaza – these precedents suggest they will not be as extreme as the Taliban, nor are they likely to support Al Qa’ida. They will fight them instead, as Hamas do in order to avoid giving the US any excuse to target them. Zawahiri and most armed jihadists or terrorists hate Islamic political parties like the Egyptian Muslim Brotherhood that seek political power through the ballot box – and are in turn hated by them. 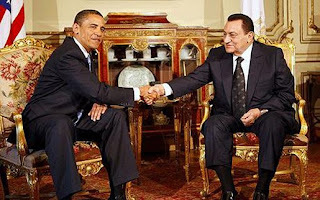 Many people are claiming Obama and the US government face a dilemma on Egypt – that if they don’t keep backing Mubarak’s dictatorship the Egyptian Muslim Brotherhood could take power and form a government hostile to the US, or even friendly to Al Qa’ida. The same people have tried to re-write history to claim the Shah was overthrown in 1979 due to Carter not backing his dictatorship strongly enough. What we know about Egypt today and the similarities with (and differences from) the events of the 1979 Iranian revolution show that Obama faces no such dilemma though – because backing the dictatorship is even more likely to allow a more extreme Muslim Brotherhood government to come to power. In 1979 Carter continued to support the Shah’s dictatorship and urge him not to step down or go into exile even after the Iranian army and SAVAK secret police had shot hundreds of unarmed protesters dead and dragged thousands away to torture. Soon the Iranian army couldn’t stomach facing killing thousands of their own people; and as the demonstrations grew bigger and bigger the military refused to fire on the demonstrators and some began to join them. Carter’s adviser Zbigniew Brzezinski favoured moving from a civilian fronted monarchical dictatorship to a military government, but was over-ruled. His plan was irrelevant anyway as the majority of the military weren’t willing to kill for the Shah anymore (Brzezinski has improved with age and experience – now calling for negotiations with Hamas). The Shah fled into exile and in the chaos Khomeini and the Islamic fundamentalists among the revolutionaries were able to eliminate the socialists, liberals and others (2) – (3). The strategy of backing a dictatorship did not prevent an Islamic fundamentalist theocracy hostile to the US and Israel, but created one. This was due both to decades of US backed torture and killings by the Shah’s dictatorship and due to Carter’s decision to back it to the last rather than help encourage an orderly transition to democracy and support the more democratic elements of the opposition. There is a situation in Egypt today which is similar in some ways but very different in others. The pro-democracy demonstrations were begun by (mostly secular or moderate Muslim) students and trade unionists, are backed by liberals like former UN International Atomic Energy Agency (IAEA) head Mohamed El Baradei and according to Amnesty and International ‘‘This was a protest that crossed class, ideology and religion, and that is what scares the government.’(4) The Muslim Brotherhood have since joined the protests, but are not leading them. So while, as in Iran in 1979, the opposition includes Muslim fundamentalists along with socialists and liberals, the balance of power among them is different. Human Rights Watch’s were reporting as of yesterday at least 83 people killed so far in Egypt, mostly by soldiers and both uniformed and plain clothes police shooting them with live ammunition or rubber bullets. 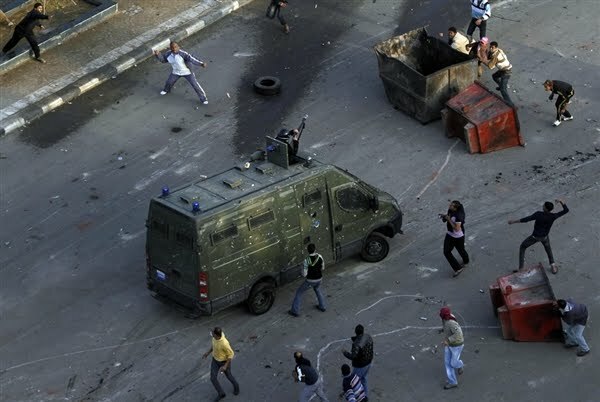 Reuters similarly reports over 100 dead and 2,000 injured, based mostly on Egyptian doctors and hospitals’ reports (6). According to a 2004 Human Rights Watch report and Amnesty International’s 2010 annual report on Egypt, adults and children arrested in Egypt are often tortured by methods including “beatings with fists…batons… sticks…and electric cables…suspension in…painful positions…electric shocks” and “sexual intimidation and violence” including sexual abuse of children. Many victims of torture are beaten to death (8) – (9). No wonder the Egyptian people won’t tolerate a government that does this to them and their children. How can the US government justify continuing to support it? There are conflicting reports about whether “looters” and killers are “thieves” and “Muslim brotherhood” or plain clothes (and fancy dress) secret police (10). Many Egyptians suspect the latter . 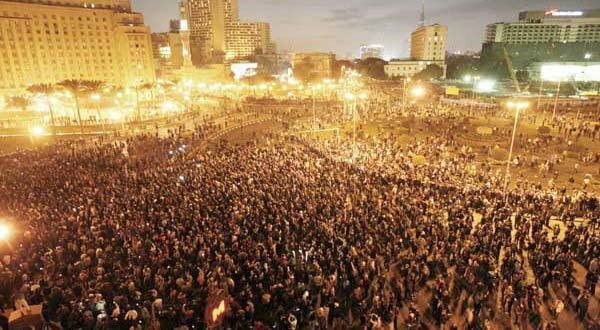 Police have certainly done nothing to stop the looters – with ordinary Egyptians organising to defend themselves from them - which makes it likely the dictatorship hope allowing chaos will let them dishonestly pose as the only thing preventing chaos (11). The soldiers and police responsible for the killings in Egypt are heavily funded and armed by the US government. The Obama administration has so far provided Mubarak’s dictatorship with $1.3bn a year of military aid (a 25% increase on the amount provided by the Bush administration), plus arms sales (13) – (14). The US government initially provided statements of support for the dictatorship even after the shooting had begun. Though some of it’s statements have been more critical since, they have stopped well short of calling for Mubarak and his NDP party to stand down and allow a peaceful transition to democracy. US Secretary of State (i.e foreign minister) Hillary Clinton on Thursday described Mubarak’s regime as “stable” and said that it was attempting to meet the legitimate needs of it’s people – claims met with well deserved scorn by El Baradei (15). US Vice President Joe Biden double standard has lead him to claim that Mubarak, as “ a good friend and ally of the United States” is not a dictator, even though he is having his own people shot dead for protesting democracy, has rigged elections, banned opposition parties and jailed the Presidential candidates even of those parties he hasn’t banned – plus jailing thousands of people without fair trial and tortured them (16) – (17). The marginally tougher line taken from Friday the 28th on rapidly became vague and self-contradictory. This may be due to splits in the Obama administration, or might be an attempt to send mixed messages in the hope of satisfying both supporters and opponents of backing Mubarak in the US. US officials first said they were “reviewing” (not suspending) military aid to Egypt – and that the future of it would depend on Mubarak “addressing the legitimate needs of the Egyptian people” and on the behaviour of his government and the Egyptian military. Clinton then reversed this – saying there is “no discussion as of this time about cutting off any aid” to Egypt, adding “we always are looking at and reviewing our aid” (18) – (19). British Foreign Minister William Hague has parroted Clinton almost word for word on Egypt, with the same lack of any call on the dictator to stand down and the same call on the dictatorship and the people to both avoid violence – as though the unarmed pro-democracy protesters fighting back against armed police with armoured cars are equally to blame for it (20) – (21). Israel’s government, as usual hypocritically condemning dictatorship in Arab countries while simultaneously allying with the dictators, has made statements supportive of Mubarak, saying it’s confident his government will weather the storm (22). Calls from the US and UK governments to address the “legitimate needs of the Egyptian people” are too vague – and calls to avoid “violence or provocations that could cause violence” are fence-sitting between the dictatorship and the people. The vast majority of violence by the protesters has been by the dictator’s police firing on or dragging away unarmed demonstrators (23). The main protest leader Mohamed El Baradei couldn’t be more different from the 1979 Iranian revolution’s main spokesman Ayatollah Khomeini. He is no Islamic fundamentalist, nor a potential dictator or theocrat. El Baradei is a well educated Egyptian and Nobel peace prize winner who lost his position as UN IAEA nuclear watchdog head after the Obama administration succeeded where Bush had failed in having him replaced because of his refusal to do US governments’ bidding in hyping Iraq’s non-existent nuclear programme in 2002-2003, or in exaggerating Iran’s nuclear programme (24) – (28) . This will not have won him many friends at the top levels of either main party in the US – whose government under Bush tapped his phone to try to get ammunition against him (29). His criticism of the Iraq war and of the Bush and Obama administration’s for backing dictatorships like Mubarak’s won’t have won him many either (30). (Baradei’s successor as IAEA head has assured US officials he’ll do as the US government tells him (31) – (33) However Baradei publicly praised Obama’s change of policy on Iran compared to Bush – and the neo-cons of the Bush administration are no friends of Obama, so he personally and politically may not be entirely hostile to Baradei (34). His high international profile makes it more difficult for Mubarak to jail or kill Baradei and boosts the protesters’ media profile. He’s also a very eloquent spokesman. Bush spent 8 years telling us Mubarak was implementing reforms and moving towards democracy. It never happened (36). It won’t happen under Mubarak or his cronies now either. Fence sitting by the Obama administration on Egypt is due to the right of the Republican and Democratic parties (along with the ever present Israel lobby) criticising them for supposedly “taking the side of the demonstrators” and risking a US and Israeli allied government being replaced by a neutral or hostile Muslim Brotherhood one (37). A peaceful, orderly transition would give the best chance for a multi-party democracy, which would be a much better result for everyone than an Islamic revolution – but that peaceful transition is unlikely unless Mubarak is persuaded to stand down and go into exile. In Turkey the AKP Islamic party (‘Justice and Peace’ party) led by Prime Minister Tacip Erdogan has been much more moderate than the extreme nationalist military dictators who preceded it. It has not meekly deferred to the US or stayed allied with Israel on foreign policy – refusing to allow US troops to invade Iraq from it’s territory in 2003 and clashing with Israel over the Israeli military attack on the civilian Gaza aid flotilla, but neither has it been actively hostile to either – and only placed restrictions on trade with Israel after the attack on it’s citizens in the Gaza flotilla. The AKP has certainly not had any links to Al Qa’ida or similar groups – instead jailing Al Qa’ida members for bombings of the British consulate and banks in Turkey (38). According to experts, such as Fawaz A. Gerges and Loretta Napoleoni, Islamic parties in the Middle East are frequently targeted by armed jihadist groups as “collaborators” for taking part in elections and hate one another. In fact Gerges found that Zawahiri (Bin Laden’s Egyptian deputy in Al Qai’da) hates and despises the Muslim Brotherhood for trying to get power through peaceful political campaigns (39) – (40). Hamas in Gaza, far from allying with Al Qa’ida or other international Jihadist groups have fought and killed Al Qa’ida linked groups and anyone allied to them in order to ensure the Israeli government cannot tar them with the Al Qa’ida brush (41). So it’s quite possible that even if the Muslim Brotherhood came to power in Egypt through elections (As opposed to taking power by force) that it would be considerably more moderate than the Taliban and no ally of Al Qa’ida. Allowing them to take part in elections is likely to make them more moderate by strengthening the hand of those who prefer the peaceful political route and weakening that of those who say force is the only thing that can succeed. Banning them from participating in elections will increase recruitment to armed jihadist and terrorist groups. There is no way to know what the results of democratic elections would be – but that is the whole point of democracy - to let the people of a country decide their own government. The Muslim Brotherhood would certainly get a significant number of votes and seats, but whether they would be the sole governing party, part of a coalition government, or the main opposition party can’t be known. While we can hope the Muslim Brotherhood don’t win elections, no-one has any right to tell the Egyptian people who they can or can’t vote for. Once again, backing the dictatorship will not guarantee the Muslim Brotherhood will be excluded from power either. It makes it more likely that when the regime does fall it will do so in chaos that could allow the Brotherhood to seize power by force rather than a National Unity government allowing a transition to democracy, as proposed by El Baradei. We should also be sceptical of our governments using the excuse that they have to back dictatorships for fear of Islamic fundamentalists, given that they arm and support the Saudi dictatorship, who, even according to Clinton’s private admissions, provide the largest haven for funders of terrorism in the world; whose religious police force schoolgirls back into burning buildings to die rather than allow others to see them “improperly dressed”; and whose government backed the Taliban (42) – (44). The US government also continues to arm and fund Pakistan’s military, who have always funded and trained jihadist terrorist groups in India, Kashmir, Afghanistan – and in Pakistan itself, to intimidate the military’s secular civilian and moderate Muslim rivals for control of Pakistan’s government, public funds and foreign aid (45). As El Baradei has said “This is what the regime ... sold to the West and to the U.S.: 'It's either us, repression or al Qaeda-type Islamists.” (46). The reality is that is not the only choice – and even if it was, it would be the choice of Egyptians. No-one else has the right to deny them the same democratic rights and freedoms they enjoy, to tell them they and their children must accept a corrupt government that tortures, kills and even rapes them and their children. Obama was feared to insist democracy in Egypt because of the possibility that triggers civil war. Like in other country many lives are sacrificed in order to get freedom and embrace democracy as form of Government.